The annual meeting held at the site of the 1662 Ford Chapel followed by a short service on the beach has been held by the congregation of Torcross Chapel for many years to celebrate the stand of early persecuted congregationalists who built the Old Ford Chapel as a place they could meet in secret. 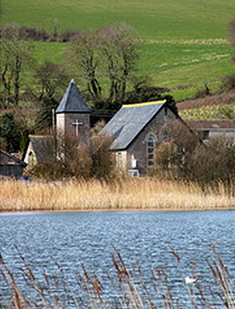 All the above pictures including those of Torcross Chapel and the surrounding Slapton Ley were taken on that day. There was a strong wind by the sea so there were no photographs taken of the beach service.